Atlanta peronii is the type species in the genus Atlanta. It attains the largest size of all atlantids (to 10 mm shell diameter). The walls of the shell are unusually thick and strong. The keel is moderately tall and rounded in side profile, with a slightly truncated leading edge. The keel base is clear in young animals, but changes with age to a light brown and then a dark yellowish-brown. 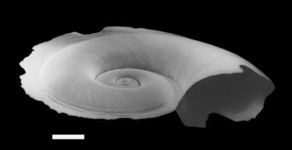 The keel inserts between the fourth and fifth whorls in shells larger than about 3 mm. 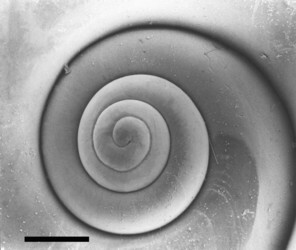 The spire is small, consisting of about 3-1/2 to 3-3/4 whorls. The whorl surfaces are smooth. 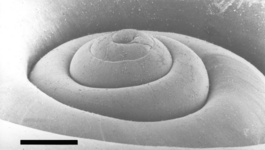 The sutures between the first and second whorls are shallow, while those between subsequent whorls are deeply incised. 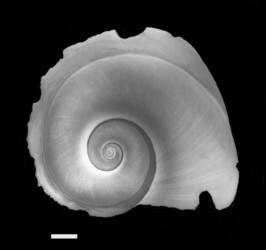 Full grown shells can consist of up to 6 whorls. Shell transparent, but can become faintly yellow in large individuals. Eyes type b. Operculum type b. Radula type II, large with sexually-dimorphic marginal teeth. 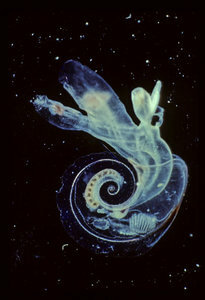 The species is cosmopolitan in tropical to subtropical waters. 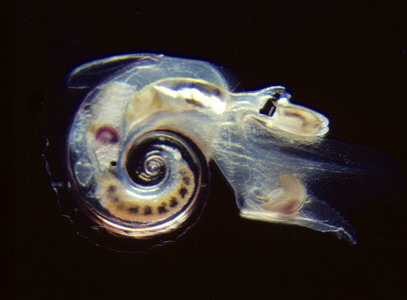 In Hawaiian waters, A. peronii is a strong nocturnal vertical migrator, ranging downward to a daytime maximum of 300 m and migrated into the upper 150 m at night. An Atlanta peronii species group was first recognized by van der Spoel (1976) and included three species; A. peronii, A. gaudichaudi and A. pacifica. Subsequently, A. pacifica was synonymized with A. peronii and A. gaudichaudi placed in its own species group that contained three species, A. gaudichaudi, A. plana and A. echinogyra (discussed in Richter and Seapy, 1999). The A. peronii species group now includes four species, A. peronii, A. rosea, A. fragilis, and A. frontieri. Richter (1993) resurrected as a valid species A. rosea, which had been described by Souleyet in 1852 but subsequently treated as a junior synonym of A. peroni by Tesch (1908, 1949), and the latter two species were described as new species. The current pair of species groups are distinguished by markedly different radulae (discussed by Richter and Seapy, 1999; see the genus Atlanta page). 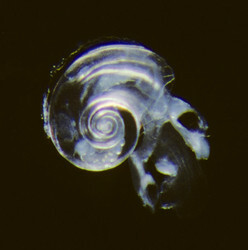 Diel vertical distribution patterns of A. peronii off the leeward coast of Oahu, Hawaii was studied by Seapy (1990b, 2008). In the former study, the species ranged downward to a daytime depth of 200-300 m (the maximal depth interval sampled), and migrated into the upper 150 m of the water column at night. In the latter study, vertical distribution patterns were studied at three stations located at 1, 5 and 15 nmi offshore. The species was recorded to a daytime depth of 160-200 m at the 5 and 15 nmi stations, while at night a slight upward migration was suggested since the deepest depth interval containing specimens was 120-160 m at both stations. Also, the abundance of A. peronii decreased shoreward by 50% from the 15 nmi to the 1 nmi station (comparison based on the mean nighttime densities at each station). Richter, G. 1961. Die Radula der Atlantiden (Heteropoda, Prosobranchia) und ihre Bedeutung f?r die Systematik und Evolution der Famiie. Zeitschrift f?r Morphologie und ?kologie das Tiere 50: 163-238. Richter, G. 1993. Zur Kenntnis der Gattung Atlanta (V). Die Atlanta peroni-Gruppe und Atlanta gaudichaudi (Prosobranchia: Heteropoda). Archiv fur Molluskenkunde 122: 189-205. Spoel, S. van der. 1976. Pseudothecosomata, Gymnosomata and Heteropoda (Gastropoda). Bohn, Scheltema & Holkema, Utrecht. 484 pp. Tesch, J. J. 1949. Heteropoda. Dana Report 34: 1-54.